Irish step dancing is a lively form of dance characterized by its fast moving and intricate footwork. Known as the national dancing of Ireland it has spread across the globe and is now danced on almost every continent. 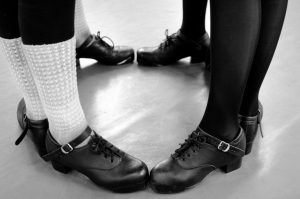 Irish dance is unique in that there is solo dancing (step dancing), which can be done in soft and hard shoe, and there is ceili dancing (group dancing). All are amazing to watch and fun to dance. Soft shoes are similar to ballet shoes in that they are made of leather and create no sound when dancing. Girls soft shoes are called ghillies and boys wear reel shoes. Dancers start out in soft shoe with the easy reel and then progress on to light jig, slip jig, and single (hop) jig. As dancers master the steps taught in these dances they learn harder steps and are able to preform these dances at higher degrees of difficulty. At championship level girls perform reels and slip jigs and boys perform reels. Hard shoes are similar to tap shoes in that they create sound when dancing. The sound is created by a fiber glass tip on the front of the shoe and a hard heel. Dancers generally begin hard shoe after learning the single jig and the teacher is confident the concept of hard shoe can be learned by the student. Dancers begin by learning basics steps in the treble reel, treble (heavy or hard) jig and hornpipe. Once the basic steps are mastered, more difficult steps are taught. Traditional set dances are also preformed in hard shoe. These dances are jigs and hornpipes that have set choreography. At championship level treble jigs and hornpipes are performed with special events in treble reel, traditional set and non-traditional set dances. Irish dance had its beginnings in ceili, or group, dances. Ceili dancing uses basic footwork with dancers weaving in and out of each other. There are 30 recognized traditional ceili dances. These dances can be for any number of couples or a set number of people (4,6,8,10,12,16) depending on the dance. Some dances are progressive, with each round of the dance switching partners or moving up and down the hall to face new couples, or they are for a set number of bars. Some dances are long dances (dancers face each other in two lines) while others are round dances (dancers face inward forming a ring). Non- traditional ceili dances are choreographed but still use basic footwork. With its quick pace and enchanting rhythms, Irish music makes you want to get up and dance! The timing of the music dictates what type of dance it is. A reel is written in 4/4 time. When danced in soft shoe it is called a reel, and in hard shoe a treble reel. Jigs are written in 6/8 time. A light jig is defined by its tempo, played at 116 at feisanna. A single jig is based on the note pattern. When danced in hard shoe, a jig is called a treble jig. Slip jigs are written in 9/8 time and are only danced in soft shoes. Slip jig music is very graceful and flowing. Last but not least are hornpipes. Written in a dotted 4/4 time, hornpipes have a skipping rhythm and are only danced in hard shoe. Irish dancing is referenced in literature as early as the 16th and 17th centuries as group or social dances that were performed at various social gatherings- weddings, fairs, holidays. These would have been simple dances that everyone could join in on. In the early 1700s, the Traveling Dance Master appeared and the Irish dancing we know today was born. The Dance Master would travel to different villages and stay for a time teaching interested villagers ‘step dancing’. Dance Masters had their own regions in which they would teach and their own distinct style. In 1893 the Gaelic League was created to promote all aspects of the Irish culture, a small part of which was Irish dancing. The League introduced dancing classes and organized social events where step dancing and eight hand dances were taught and preformed. In 1898 a day of competitions were held, this was the beginning of the feisanna or feis. In the early 1900s the traditional Irish dance costume was introduced. The costume has evolved since its introduction to suit popular styles but it still reflects the early costumes. Today girls wear a long sleeved dress with a cape secured on one shoulder and draped across the back, and either poodle socks or black tights. Boys can wear either a kilt or a black shirt and pants with a vest and tie. The vest is the more common costume today over the kilt. Both the dress and vest are adorned with Celtic designs. In 1930 the Gaelic League established An Coimisiun Le Rinci Gaelacha, the Irish Dancing Commission, to oversee, promote and foster all forms of Irish dance. An Coimisiun is a network of Irish dancers and their teachers all over the world that regularly meet to compete, share knowledge and enjoy the rich Irish dancing culture. Their mission statement is “to preserve and promote Irish Dancing, including step dancing, ceili dancing, and other team dancing, and also promote the use of the Irish language.” An Coimisiun sets a standard for teachers and adjudicators and oversees the 26 regions in Ireland, Great Britain, USA, Canada, Australia, New Zealand, South Africa and Europe. Idaho is part of the Western US Region. An Coimisiun offers certifications as a T.M.R.F. (certified in ceili dancing), a T.C.R.G (certified in both ceili and solo dancing), and an A.D.C.R.G. (certified as an adjudicator to judge at competitions). Irish dance schools are run by a T.C.R.G. who has been certified by An Coimisiun Le Rinci Gaelacha. Each school has its own distinct costume and choreography. Dancers can compete under their school name at feis. At these competitions, dancers compete in their age group and experience level in solo and ceili dancing. Dancers move up in competition levels starting with Beginner-Novice-Prizewinner-Preliminary Championship up to Open Championship, the highest competition level. Feis are held through out the year and are hosted by various schools. Each year there are three big competitions held- Oireachtas (regional competition), Nationals, and the Oireachtas Rincena Cruinne (World Irish Dancing Championship). There are also the All Irelands, the All Scotlands, the Great Britians and the British Nationals that are open to foreign competitors. Dancers wear their school costume until they reach a higher competition level, at which point they may wear a solo costume. For team dances the school costume is worn.